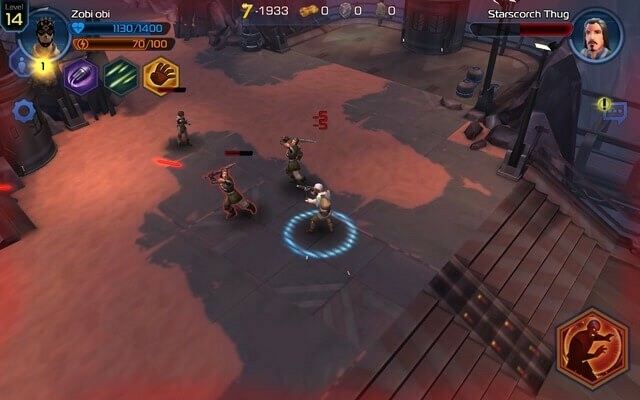 Star Wars: Uprising is a mobile RPG that revolves around the adventures of an intrepid smuggler. Players fight enemies, play co-op missions and collect loot by completing risky tasks given by faction leaders. The top-down graphics gives a bird’s eye view of the entire battle scene and lets you zoom in to get an up close and personal view of your hero as he battles enemies, powerful bosses and monsters for loot and rewards. As you progress through missions, you will discover weapons, gear items and loot. Equipping high-quality gear will improve your player rating and will give you an opportunity to battle enemies and complete harder missions for top-class rewards. Follow these quick tips, hints and tricks to become the next big intergalactic smuggler. The two main types of common enemies are melee and ranged units. Armed with assault blades, melee units will quickly charge at your hero, and will give him no room to fight back. You may go back, choose a safe spot and then shoot at them or use the Crowd Control ability to knock them back and stun them for a few seconds. You can then use the Hold out Blaster ability to get rid of them before they come closer to your hero again. You may choose an assault blade if you want a more up close and personal fight with all enemies. But have a repeating rifle is a much better option as the Hold Out Blaster ability works wonders in combination with it. Choosing the best gear for your main character is easy. The items collected are stored in your inventory. Go to your inventory by tapping on your player profile at the top-right corner of the screen. Next, press an item pic and hold to view stats, offense/defense points and player rating points. Offense and defense icons are Gun and Shield respectively. If all offense, defense player points show negative value, then you should not equip that item as it can reduce your overall gear stats and player rating. Choose items that have Offense, Defense numbers in green, which implies that the items are more powerful than the currently equipped items and will have a positive effect on your characters offense and defense stats as well as the overall player rating. When you discover a new gear, the game notifies you and a “New” label is shown at the top of the item profile pic. A new gear item discovery also means rewards and the Armory will notify you about any new items you have discovered or leveled-up. Make sure you have two or more items of the same type. Salvaging duplicate items not only give you valuable components but also free up space. 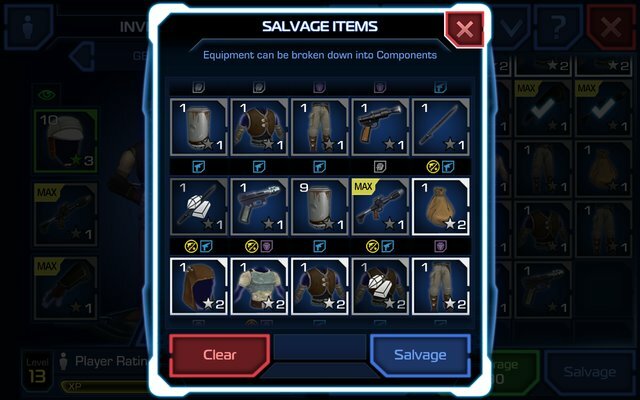 Don’t salvage those items that are part of an armor or weapon set. You may have plans to max out an armor set to receive a blueprint, so you would not want to break them down into components. Be careful and choose only those items that you do not need. Go to the Armory to check whether you have acquired all items of a particular set. Next, max out each item to get blueprints and just make sure you don’t salvage them accidently. You can check what crystal type you might receive before salvaging items. The type of a crystal decides what offensive/defensive benefits it can provide to the upgraded item. Tap on Inventory and then tap on an item you want to salvage. Noticed the crystal type icon? It’s just below “Crit Chance” under “Salvage:”. A gun icon indicates offensive benefits a crystal will provide and a shield icon shows defensive benefits of a crystal. If the icon is both gun and shield, then the crystal you will get from salvaging an item could provide a balanced benefit. There are other icons as well, such as utility. Many times, you will find waves of enemies attacking your hero. Some will shoot from a distance, whereas others will come closer to your hero with their assault blades. You have no option but to eliminate them and only then you can reach the next area. Just don’t rush into your enemy territory. If surrounded by enemies, go back, choose a safe spot and then use the Hold Out Blaster ability to attack them. You may also choose the diving roll to roll to a specified location and then shoot at enemies. With the diving roll ability, you can avoid explosions and blaster fire. The best part of this game is that it lets you move your hero anywhere you want. The previous cleared area won’t be locked and you can move your hero back in case he or she is surrounded by multiple enemies. Use a combination of diving Roll, Crowd Control and Hold Out Blaster to take down enemies faster. Many times, you may be confused as to what gear should you salvage and which ones should be kept for leveling up to the maximum level. The ones you plan to keep as part of a full set can be maxed out/upgraded for blueprints, provided that you have the complete armor set. The blueprints can then be used to upgrade rare crew members. Do keep in mind that you will have to max out each item of an armor set before you can get blueprints for that particular set. A small tick can be seen at the top of an item showing it has maxed out its level (Go to Armory to Check Which Items in a set have maxed out). You will have to spend precious materials to level them up and max out. The problem in this entire procedure is that you may max out poor-quality items just of the blueprints in the beginning, ignoring those that need to be leveled-up first in order to have an edge in battle. Remember you need a proper player score before you can start a mission. Many times, you won’t be able to start a mission or will receive a warning if your player score (which includes your gear score) is below or slightly above the recommended mission score. Also, the higher the player score, the more the chances of playing for greater rewards. Your focus should be on leveling up and upgrading good quality gear, irrespective of the armor set they belong to. So here’s what you may do. 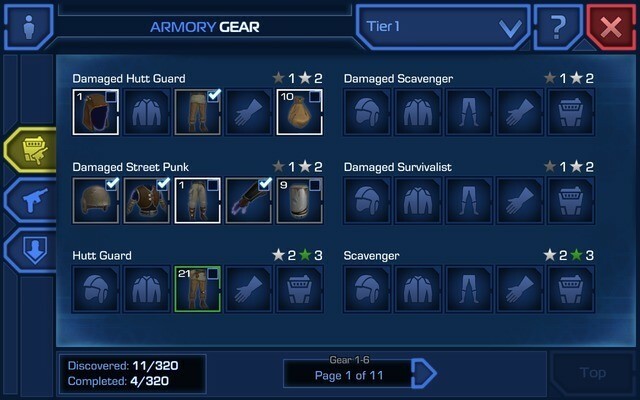 Max out high quality items of an armor set, wait for the set to complete (win more story, repeatable and assault missions in every star system to increase the chances of getting better gear items. Go to Supplies and buy them for chromium to get high-quality gear items). Don’t just keep on maxing out a poor quality set just because you have to or because you need blueprints. Your first preference should be leveling up and upgrading high quality gear items even if you have an incomplete armor set. In case your character is equipped with different types of high-quality gear items, each from a different armor set, level them up to increase your gear score. Have those abilities that slow down enemy movement or stun or knock enemies for a few seconds. Caltrops and Crowd Control can do this job. 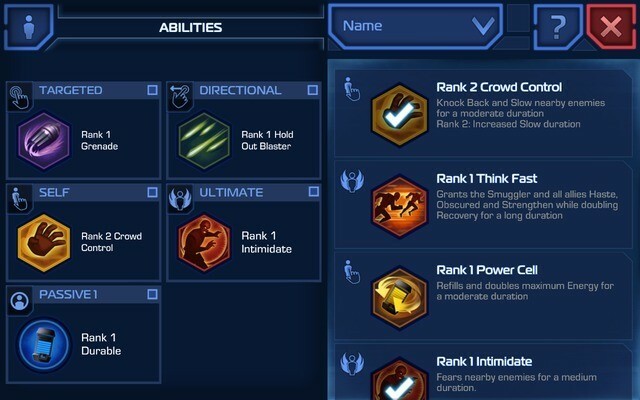 Use one of them and try to get higher-ranked abilities for better results. These two can be quite useful against a large group of enemies. Have a Passive ability that increases ranged damage inflicted by your rifle or reduces melee and ranged damage from enemies. Durable and Overcharge are such abilities. For your Ultimate ability, use Intimidate to invoke fear among nearby enemies. An ultimate ability charges up when your hero deals or receives damage. In case of “Self” abilities, the best option is to use crowd control to knock back melee units. Rank 1 Hold Blaster or Scatter gun (Directional Gesture Control) is a must-have if you want to eliminate multiple enemies at once. When Crew Runs gets unlocked, you will notice a new icon just below the sector icon to your right. Tap on it and tap on Crew Runs. In the beginning you will have only one crew member that you received from Supplies (A tutorial will show how to get supplies from Brask’s Item Barge). Send that Crew member on a “Crew Finder” mission (takes approx. 30 minutes in the beginning. May take more than 30 minutes next time). You will get another crew member. You now have two crew members. You may now send one member on a Material, Reputation or Currency finder mission and send the other on a Crew Finder mission. Note: Chances of getting more characters from Crew Finder will become a bit harder as you progress. Try to improve your gear and play higher-level reward missions to increase the chances of getting a new rare member. 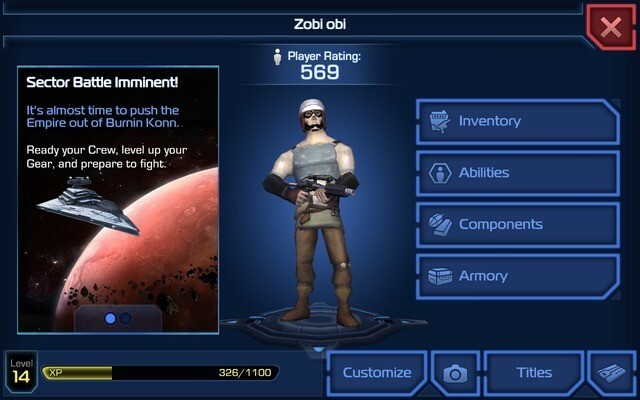 Star Wars: Uprising may seem to be too deep with so many mission types and gear items, but the core gameplay revolves around leveling up/upgrading items to get a favorable player rating. A player rating slightly higher than the mission rating means that the mission can be accomplished, but there are chances of defeat. You need to have a player rating quite higher than the recommended player rating to get a “Good” status. However, you can still win a “risky” mission if you have the right abilities, gear and weapons. Improving gear numbers by equipping your character with high quality gear items, leveling them up/maxing out and then upgrading them (needs crystal) is one way to increase the overall player rating. As you progress through different missions, you will discover various items and weapons. Choose the ones that have better defense/offense/player rating numbers than the equipped items. Directional: Tap on your character, drag, hold and move your character to inflict max damage to your enemies. The Hold Out Blaster and Scatter Gun uses Directional gesture. Self: Tap on a character to activate “Self” abilities. Most abilities refill energy, health or provide a temporary crowd control or auto-attack. Passive: No gesture control needed. Example of a passive ability is “Durable” It reduces melee and ranged damage by 5 percent and you don’t have to tap on anything to do this. Ultimate: It gets charged up when your hero receives and deals damage. You will notice the Ultimate ability meter at the bottom-right corner of the screen. Make sure you have different abilities based on gesture controls and a passive ability before you start your adventure. Assault missions become available when you finish the first set of story missions of a star system. Playing these missions will earn you gear and weapons. You may also take a human player with you if a mission allows 1-2 players. Playing co-op helps you defeat enemies faster and complete a mission much quicker than playing solo. However the other player will receive the rewards from the chest if he opens it. Also, he will collect coins if he destroys objects that lay scattered on the battle ground. 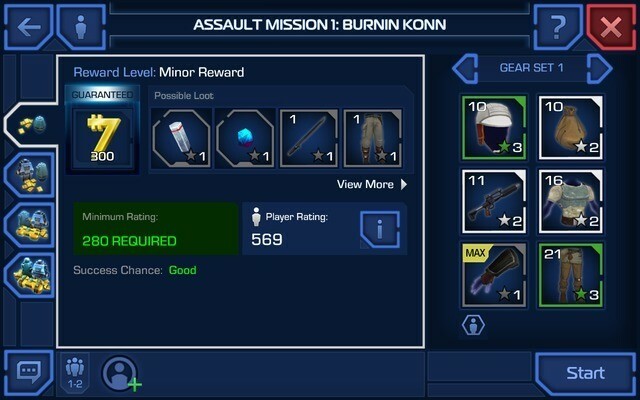 Tap on a star system and choose an assault mission from the list (note the number of players beside the mission info). Tap on the assault mission and press “Start”. In the Assault Mission screen, look at the bottom of the screen for a green plus sign. Press the plus sign to invite a human player. The player may or may not accept your invitation. If he accepts, wait for a few seconds to get the green tick mark and then press start. You can get a list of your currency collection in one place. Tap on your main character’s profile pic on the top-left corner of the screen. Next, tap on the currency button, which is located just beside the “Titles” button at the bottom-left corner of the player profile screen. With faction currencies, you can purchase higher-ranked abilities. Faction currencies can be earned by completing faction opportunities and crew runs. Keep an eye on Daily rewards and log-in daily to receive consecutive login rewards and rewards from monthly stamp sheet. When fighting a boss, check your player’s HP. You will find a Bacta station or two somewhere close to the boss’ layer. Don’t heal your character if his/her HP is 75 percent. Tap on a Bacta station only when his health is depleting fast or is less than 50 percent. You can access your inventory while playing a mission. What’s more, you can upgrade your weapons, level them up using materials whenever you want while fighting enemies.